Today’s marketing demands are higher than ever. With infinite opportunities brought on by digital marketing, companies are asking for more, and we don’t blame them. 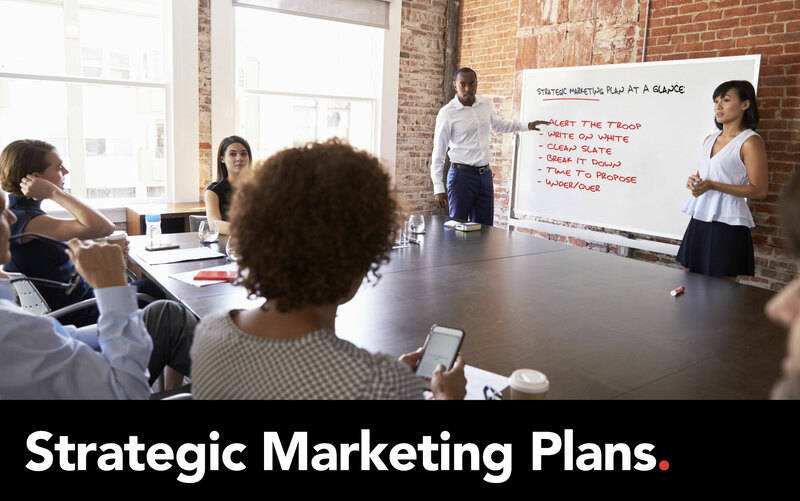 Gone are the days of saying, “take our word for it, our strategy works!” Creating a strategic marketing plan can’t be a point and shoot endeavor. We’ve invested a lot of time and money into curating our team and to keep them out of our marketing meetings would be a shame. It’s important to us that we all lend our voices to the conversation. Outside points of view can make the difference between deploying the right strategy and falling short. How do we make it happen? Here’s a play by play of how a strategic marketing plan gets created at Carte Blanche Media. Before we get the team together around the conference table, we reach out via email. If your company uses a communication/messaging software, you can use that too. Give the squad a heads up about the client, who they are and what they’re looking for. This will allow them to brainstorm some ideas before being asked to present them at the office. Often times, our team comes up with ideas while commuting to work or during other activities outside of the office. The most random occurrence can spawn an amazing idea, or at least bring something to the table to springboard from. We strongly believe in using a whiteboard as a reference point during our team meeting. Setup your whiteboard in advance with the main objectives put forth by your client. Address each goal (the order isn’t important at this stage) and make sure to keep things organized as the meeting progresses. Creating a strategic marketing plan can get confusing if you don’t jot down pertinent ideas. Let each individual on your team express their thoughts while you filter and write down the best ones. These ideas will serve as a reference point as your meeting continues. Have your eraser ready. Though some ideas may seem great on the spot, as your meeting goes on, other solid ideas may take their place. Talking points may jump from place to place so don’t worry about keeping things in a particular order. Our primary achievement is to develop a rough layout that will aid in creating something more concrete later. As your board is being filled with great insight, step back and assess. Once you’re happy with the content and space is getting slim, take a picture of your work so far. Keep your phone handy while you erase your general layout. If you happen to own a huge whiteboard, organize yourself in a way that all the preliminary ideas are visible, while you move on to honing in on the next phase of your strategic marketing plan. For further help and guidance, check out these free marketing plan templates over at Hubspot! Now that you have a nice clean whiteboard in front of you, it’s time to refer back to your preliminary layout, hone in, and start assigning tasks to the appropriate members on your team. Our team then takes their given tasks and further expands on what they need to accomplish them. Additionally, they get back to us with a timeline and an estimated hourly breakdown for each task. The time schedule provided isn’t meant to be set in stone. It’s an approximation that’s meant to give you an idea of the potential budget. Once you’ve compiled your team’s approximate timeframes, you can now move on to working on your client’s proposal. In your proposal, stay true to your team’s hourly breakdown. Side note: make sure that your team understands that although the project is time sensitive, meeting a deadline doesn’t mean a solid finished product. Especially in creative tasks, sometimes things need time to blossom. As far as the proposal, we always underline the benefits of our strategic marketing plan and how each task is important for our client’s growth and ultimately, increased ROI. The cliche is true: under promise and over deliver. Give your team a time buffer in order to make sure that you don’t fall flat on your face. Putting the odds in your favor gives your team a greater chance to shine. When you exceed expectations for a client, their loyalty to you will exponentially increase. Alert The Troop: Reach out to your team and make sure they get a brief breakdown on the imminent meeting and your client’s main objectives. Write On White: Use your whiteboard for brainstorming ideas and insight pertaining to your client’s goals. This serves as a great reference point moving forward. Clean Slate: Take a picture of your whiteboard for reference and proceed to erase it. Now’s the time to hone in and create a proper task delegation list. Break It Down: Once your breakdown is complete, assign tasks and give your team a deadline to get back to you with time-based completion estimate. Time To Propose: Remember to give your team a time buffer while also making sure to outline the major benefits of your strategy to your client. Under/Over: Today, clients want more than just a thumbs up. Their loyalty depends on exceeding their expectations, so under promise and over deliver!